Discussion in 'Online Casino Promotions' started by Marina, Jul 24, 2016. Thrilling Start to Summer at Top Online Casino Thrills! This summer promises to be more thrilling than ever, thanks to the 2016 Summer Olympics in Rio de Janeiro. Online casinos are gearing up to bring their players sporting themed fun with Olympic sized rewards – and players stand to gain a whole lot from these offers! we jump into challenges, free spins riddles, winning boosters and exclusive slots tournaments which are sure to keep you entertained and rewarded for a long time! 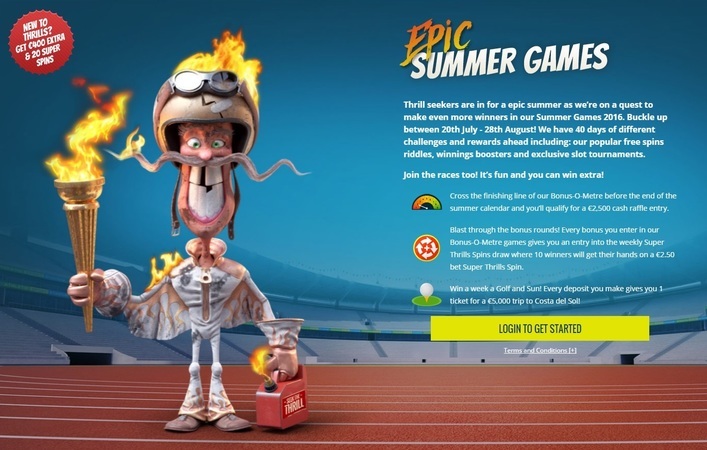 If you cross the finishing line of Thrills Casino’s Bonus-O-Meter before the end of the site’s summer calendar specials, you will be able to qualify for a €2,500 cash raffle entry. This is a great way to have fun AND put yourself in line to win big. Win-win! Thrills Casino invites you to “blast through the bonus rounds”. For every bonus that you enter in the casino’s Bonus-O-Meter games, you will win free entry into the weekly Super Thrills Spins Draw. Ten very thrilled players will be able to win a €2.50 bet Super Thrills Spin each week – definitely the kind of spin which goes a long way in increasing those rewards. Win a trip to Costa del Sol! If a full week of fun in the sun and golf on the green sounds like your idea of the ideal holiday, then earn tickets into the draw and you could be jetting off with a partner. Every deposit earns you one ticket into the Costa del Sol draw at Thrills Casino. The Epic Summer Games will run until August 28th, 2016 at Thrills Casino. When you win free spins, Super Spins, Thrills Spins and Super Thrills Spins, there are no wagering requirements in order to draw your winnings. Thrills Casino will pay you out your winnings by 18:00 on the day on the day of the draw. All players who complete all levels of achievements during the promotion period will be paid out at random in the Bonus-O-Meter cash raffle. Cash prizes are as follows: 1st place – EUR 1,000 in cash, 2nd place – EUR 500 in cash, 3rd place – EUR 300 in cash, 4th – 10th place – EUR 100 in cash. Every bonus entered into the Bonus-O-Meter games earn players one entry into the weekly raffle of 10 Super Thrills Spins. These spins will be paid out at EUR 5 and, once more, there are no wagering requirements on these spins. The Costa del Sol trip – Every deposit made during the qualifying period will earn you at least one entry into the final draw. The full value of the prize will be transferred to your account. General Terms and Conditions from Thrills Casino apply.